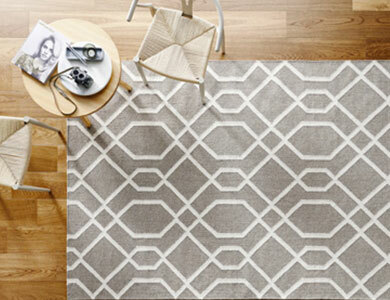 Once dirt gets into the fibres of your rug, it can be very difficult to get it back out again. It’s a good idea to encourage your family and guests to remove their shoes before entering your house. Investing in large, good quality doormats from a hardware store can also trap a lot of dirt outside before it is walked onto your rugs, and a wet room or small place to store shoes outside will encourage people to remove their shoes without being asked. To prevent excessive and uneven wear on your rugs, or fading due to regular exposure to the sun, turn them around a few times a year. If you’re feeling really ambitious, consider rearranging the furniture in your living areas! This will help redirect your home’s human traffic away from overused areas of your rugs, and give them a break for a season or two. 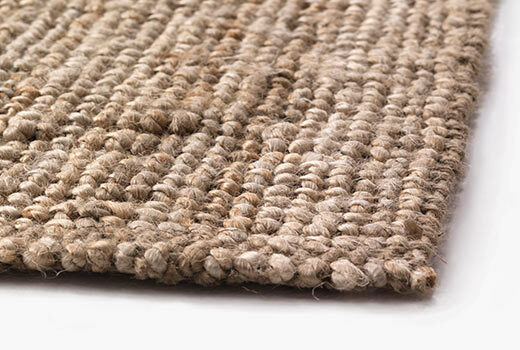 Rugs made from natural fibres (like coir and sisal) have a large, open weave that causes dirt to fall through to the floor underneath, so vacuum both the rug and the floor frequently. 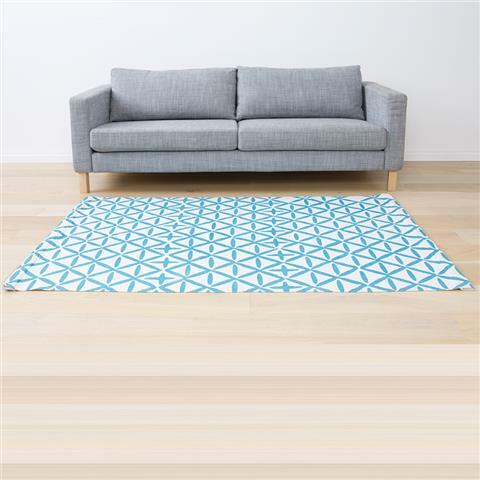 Because these rugs are usually reversible, you can also turn them over every time you vacuum, for even wear. No matter how hard you try to keep it out, dirt is still going to get inside, whether it is walked in, or whether it is airborne dust settling in your home. Frequent vacuuming is essential to prevent dirt lodging permanently in the rug fibres, and causing stains that are difficult to remove. This is especially important in high-traffic areas and in doorways. Consider buying a good bagless vacuum cleaner with a HEPA filter, which means the particles you vacuum won’t just blow back out the end of the machine. The initial expense is pretty big, but the life of the machine is much longer that of a cheaper model, and you’ll eventually recoup your outlays. The health benefits of reducing allergens in your home will also mean that the machine pays for itself pretty quickly. On synthetic or plant-based rugs, multi-directional vacuuming with a beater brush works well to remove dirt and prevent staining. On wool rugs, a beater brush might fuzz the fibres, so using a floor tool works better. Place a nylon screen over antique or handmade rugs, and weigh it down at the edges with books or bricks, and vacuum over the screen rather than directly onto the rug; or put a piece of nylon mesh over the vacuum cleaner head and vacuum as normal. For pet hair, it is better to brush it out with a stiff brush, which removes a lot more than the vacuum cleaner alone. Beating or shaking the rug outside is effective for loosening dirt that the vacuum has missed, and you can also vacuum the opposite side of the rug to bring more out. If you have just a little spill, you might avoid the expense of professional cleaning by treating the stain yourself. To treat a spill, blot, don’t rub: rubbing will only push the spilled contents further into the pile of the rug and permanently stain it. Blot by absorbing the bulk of the spill with a wad of paper towels, or a clean tea towel or bath towel, pressed into the spill with the heel of your hand on top. If you need to, make up a cleaning mix of clear hand-dishwashing soap diluted in water; avoid using laundry detergents, or thick and coloured detergents, because they will leave residue in the carpet or affect the colour. Consider drying the spot with a portable fan or a hairdryer. Home cleaning is never recommended for pure wool rugs, because the material absorbs a lot and is hard to dry, and it is also sensitive to the pH of many cleaners. Many supermarkets and hardware stores have wet-dry vacuums available for rent, but they are often not very powerful, and you could make your rugs worse if you don’t know what you’re doing. For a large spill, or a thorough seasonal clean, you really need professional help: Terry’s Steam Cleaning are available when you need us, and we have the right tools and expertise to be trusted with your rarest and most valuable floor coverings, so call us now for a quote. As a general rule, to prevent permanent staining and to maintain the quality of your rugs, you should have them professionally cleaned once a year. At Terry’s Steam Cleaning, we have a broad knowledge base about the correct way to clean a vast array of rug types, and we will use the appropriate cleaning solutions for the fibre content of the rug, according to the manufacturer’s specifications. If you are unsure of the proper care instructions for your rugs, we can advise you on whether they need to be dry-cleaned or spot-cleaned, whether the rug is colourfast, and which method will be most effective. Call us now for a quote or advice, to start enjoying the freshness and new look of your rejuvenated rugs.